I reckon your living in Munster too long AZ. Kerry folk are very precious towards Hayes and I think they often miss his point. He like many people has no time for the Kerry eulogising that exists in RTE and in the print media. He seems to genuinely believe that the current Kerry team and players aren't a great team in comparison to the great teams of the past. Now I do stand corrected on the Kerry front as he does harp on it about it a bit but in a world where we live in the instant he does have a point (he probably could express it a wee bit better) and I'd say the herald are putting the final touches to an 18 page supplement on Dublin's own version of the holy trinity. Imagine the hyperbole around a Dublin v Kerry All-Ireland, the great recession derby. Dinny, the man is full of shite! Can't stand Hayes, biggest media w**ker going IMHO. Never thought I'd say it but Brady is very entertaining, bit rough round the edges but gives a good players view. The thing about that assessment, and about Hayes in general, is that there was as much myth and hype surrounding the team he played on. Maybe you dont remember the late 80's and '90s but I do and the whole Meath v Dublin-centric media coverage and eulogizing was as bad (or good..whatever way you want to look at it) as Kerry v Dublin. Hayes clearly does not like Kerry. Given he is a media man himself and is one of the worst proponents of "say anything to sell papers" then getting worked up about the "eulogizing" of Kerry in the media does not ring tue. Also, it cant be explained by any grudge during his playing days given there was no real rivalry during his career except for the '86 semi final ...but therein lies the crux of the issue I feel. The defining image of that game is the "keystone cops" way the Meath players ran into each other when Ger power scored. This image does not fit nicely with the subsequent view of that Meath team. Combine that with the accusation that (whisper it) Meath won their AI when Kerry were out of the picture and you might go some way toward explaining why he seems to bristle at the mere mention of Kerry. 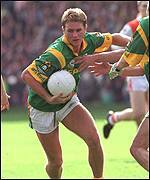 How many all irelands did Kerry win while Meath were out of the picture? We would have made bits of you in '97 if it wasn't for Martin Lynch getting half our team suspended for the Leinster final and fckin Elvis Presley rising from the dead to score 2 goals for Offaly. Ah cmon now jinxy, it doesn't work that way and you know it. We are the gold standard. There's a good reason for that! It goes all the way back to 2003. You wouldn't have got near Kerry, Mayo would have made shite of ye in the semi. Mayo wouldn't make shite of shite. he scored the goal just after missing the pen. he bagged another good goal as well after that 1st goal, so i guess he was just sharpening up!